Manuhiri (guests) and students in front of the new multi-purpose space. It was a lovely, warm sunny day on 15 February for the opening and blessing of our new multi-purpose room. The new room has been nearly two years in the planning and building. Now it is officially ours, and we have named it Pohutukawa Room. The multi-purpose room will be used for the arts and music, cooking, and a space for teachers and teacher aides to work with small groups of children. Cardinal John Dew blessed, opened and officially handed it over to Board of Trustees chair Tane Wilson. Tane welcomed everyone, supported by students and staff singing the school waiata. Guests included the Hon Trevor Mallard, MP for Hutt South, Mr Ray Wallace, Mayor of Hutt City, Sarita Smit from the Archdiocesan property team, Natasha Khaw the project manager, neighbouring principals and other Archdiocesan staff. 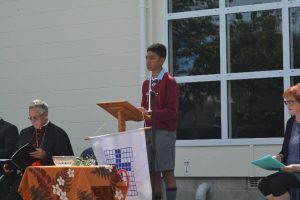 School leaders Mason Aifou-Aloisio, Amber Wilson and Junior Fa’asoa helped welcome guests and led the prayers and Gospel reading. Cardinal John spoke of the school’s long history and the RNDM (Mission) Sisters who served this school for 105 years. The last sister who finished teaching at the school in 2014 is still involved as a volunteer. Sr Theresa Galvin, their archivist who works next door to the school, represented the sisters. Cardinal John blessed the building and challenged all to ‘walk the way of Jesus, live the life of Jesus and tell the truth of Jesus’. Guests were invited to view the room and to afternoon tea. We are extremely grateful to the Archdiocese for this building and we look forward to using it to enhance our school programme and to have the space to develop our arts curriculum. 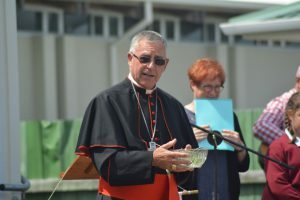 Cardinal John gives prayer of blessing. 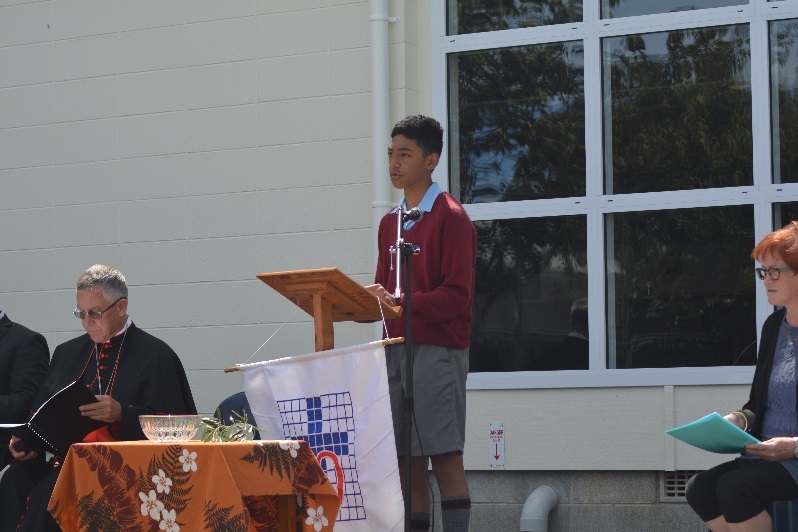 School leader Mason Aaifou-Aloisio leads the opening prayer.